Boeing’s secret media campaign was discovered in 2012 after it was inadvertently posted online. 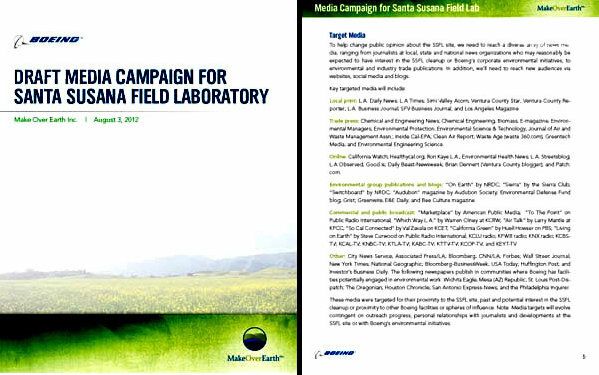 In 2012, community members discovered that Boeing had hired a company with the Orwellian name “Makeover Earth” to try to change the narrative about SSFL and “shift discussions from a site with a sordid past to one with potential.” The idea was to divert attention from the contamination at the site and instead push feel good stories about SSFL and what a nice open space park it could be. 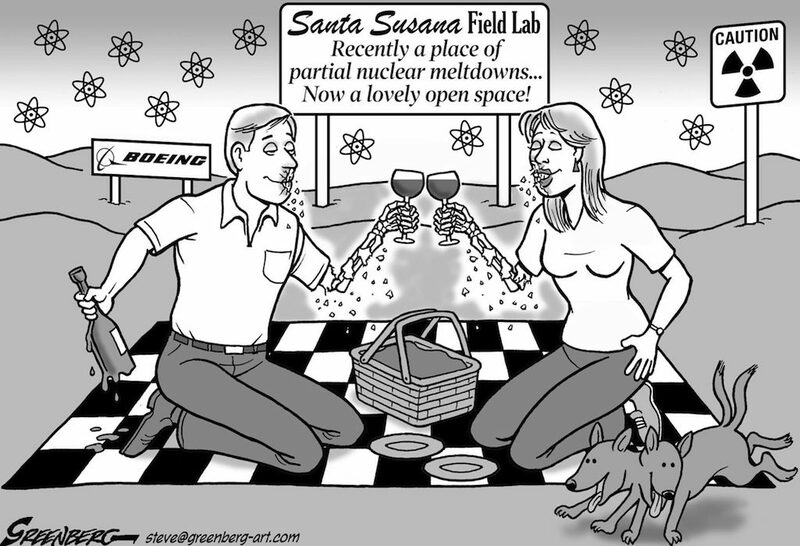 Of course there’s nothing wrong with open space per se – if SSFL were fully cleaned up first. But that wasn’t really what Boeing was selling. Boeing knew that if it could spin an open space story, it might be able to get out of its expensive cleanup obligations because open space cleanup standards are based upon people being on the site infrequently and so are extremely weak. At SSFL, open space or recreational cleanup standards would result in about 98% of the nuclear and chemical contamination not getting cleaned up! And of course, people live near SSFL and if that much contamination is left behind, it will continue to migrate and threaten their health. Boeing would save a ton of money, by transferring that cost onto the public’s health. Boeing had already been looking to create “third party” allies in 2009, when it pushed for the creation of an SSFL Community Advisory Group (CAG), a tiny group composed partly of former officials of parties responsible for the SSFL pollution, pushing Boeing’s position for virtually no cleanup, and even offered to fund the group. Despite the objections of hundreds of community members and elected officials, the SSFL CAG was approved by the Department of Toxic Substances Control in 2012 and has been opposing the promised cleanup ever since. 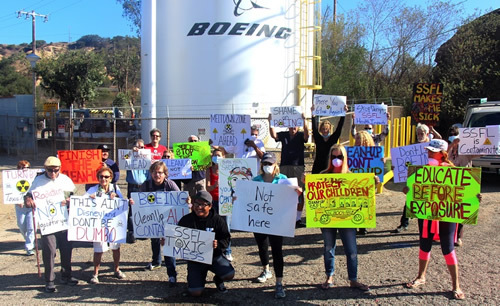 Boeing and its surrogates claim, straight-faced, that the nuclear and chemical contamination at SSFL has not caused any health problems, poses no threat to the community, and that it is the cleanup of the contamination that is the problem! That may seem outrageous, even laughable to many people. But with continued lobbying and underhanded tactics, Boeing has worked hard to persuade and instill doubt in some people, all with the goal of avoiding the expense of living up to its cleanup obligations. Hosting hikes and tours of SSFL. Part of Boeing’s green-washing plan has been to hold hiking and bus tours at SSFL, where it can boast about the site’s accomplishments (leaving out the accidents and negligence that contaminated the site of course) and greatly minimize how contaminated the site truly is. On one tour, a Boeing representative told attendees that after its cleanup, the site would be safe to hike once a week. Once a week? Think about that. If the site will only be safe to hike once a week, what does that mean for all of the residents who live nearby, all the time? SSFL is on top of a hill, so contamination will continue to migrate off site and keep communities at risk of exposure. Procuring an easement that Boeing claims will commit SSFL to be forever preserved as open space. The easement, however, is with a controversial Pennsylvania land trust with a reputation for cutting questionable deals with business. It is not a certified land trust, so it is not required to live up to the standards for most land trusts. The agreement does not preclude building on the property, or transferring the land to a Native American tribe that claims immunity from its requirements and could build a casino on the land. And it is unenforceable by the County or anyone else, other than the land trust itself, which does not have to enforce it and has little incentive to do so. Launching its own propaganda website, protectsantasusana.com, a blatant attempt to erase and rewrite SSFL’s toxic legacy and urges the public to send in comments to DTSC and elected officials asking for a minimal cleanup that would leave most of the contamination on site. That Boeing is asking people to lobby on its behalf, against their own interests, is astonishing and reprehensible. The bottom line is that Boeing has a lot of money and influence, which it is using in an underhanded and deceptive fashion to try to get out of its obligations to clean up its contamination that puts people and the environment at risk. We, however, have people power – but only if everyone who cares about getting SSFL cleaned up takes action NOW and encourages others to do so as well. Contact your elected officials and tell them you want SSFL fully cleaned up, as promised. Click here for information on your US Congressional representative, and click here for information on your California representatives. Sign up for the Rocketdyne Cleanup Coalition mailing list for cleanup updates and information about other actions you can take to help assure that SSFL is fully cleaned up. Boeing’s greenwashing campaign is intended to persuade the public that SSFL will be a park so it shouldn’t have to clean up most of the contamination.